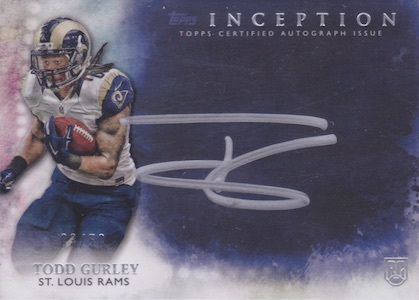 2015 Topps Inception Football is an early-season favorite because of the distinct design and hard-signed content. Boxes include two autographs or autographed relic cards and one relic card. 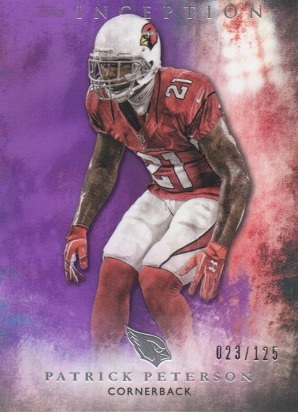 The 2015 Topps Inception Football base set includes 100 veteran players and a large mix of parallels, including Green (1 per pack), Purple (#'d), Magenta (#/99), Red (#/75), Orange (#/50), Blue (#/25), Diamond (1/1) and Framed Printing Plates (1/1). 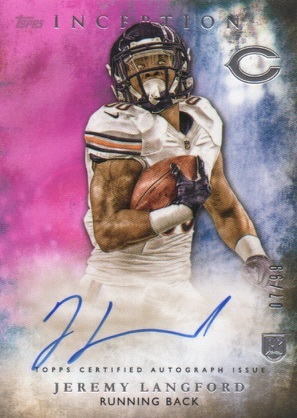 Rookie Autographs are signed on-card and obtained at the NFLPA Rookie Premiere. In addition to the base autographs, there are Purple (#'d), Magenta (#/99), Red (#/75), Orange (#/50), Blue (#/25) and Diamond (1/1) parallels. Upping the ante for the rookie subjects, Inception Silver Signings, serial numbered to 50, combine silver ink and a black design. Several gold ink parallels are also available, including Gold Signings (#/25), Gold Signings Nickname (#/10), Gold Signings Inscriptions (1/1) and Gold Signings QB Playbook (1/1). 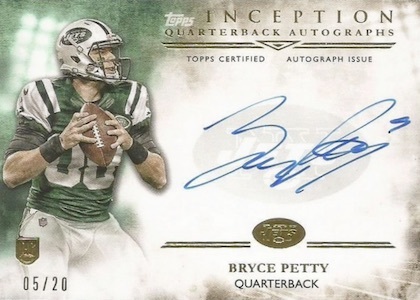 Rookie quarterbacks receive an additional focus in 2015 Topps Inception Football with QB Inception Autographs. The base version is serial numbered to 20 and Orange (#/10), Blue (#/5) and Diamond (1/1) parallels add more variety. The rookie fun doesn't end there as Quad Rookie Autographs (#/25) and Six Rookie Autographed Books Cards (#/10) offer multiple rookie signatures on the same card. Both also include one-of-one Diamond parallels. Inception Autographed Jumbo Patches pair an autograph and large jersey relic. Green (#'d), Purple (#/75), Magenta (#/50), Red (#/25) parallels feature multi-color jersey swatches while Orange (Glove - #/10), Blue (Nike Swoosh - 1/1), Diamond (Team Logo - 1/1) include more premium relic pieces. The remainder of the autographed relics are all rookie book cards, including Inception Autograph Patch Book Cards (#/5), Inception Autograph Laundry Tag Book Cards (#/5), Inception Autograph Letters Book Cards (1/1) and Rookie Autograph NFL Shield Logo Patch Book Cards (1/1). 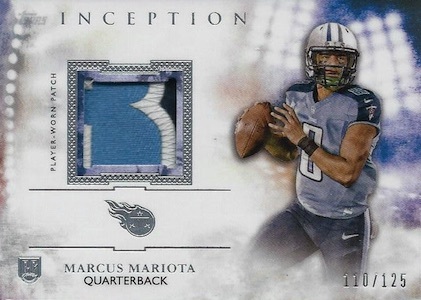 Relic cards fill out the rest of 2015 Topps Inception Football and average one per box. In addition to the base Rookie Patches (#'d), collectors can find multi-color relics in the Magenta (#/75), Red (#/50), Orange (#/25), and Blue (#/10) parallels. Diamond parallels (1/1) add a team logo patch. Similarly, Rookie Jumbo Relics (#'d) also feature several parallels, including Purple (#/75), Magenta (#/50), Red Patch (#/25), Orange Patch (#/10), Blue (Team Logo Patch - #/10) and Diamond (Nike Swoosh - 1/1) . 42 cards. No listed card #24 and 42. 7 cards. Serial numbered #/25. 40 cards. Serial numbered #/125. Good: Two autographs per box, distinct design, premium card stock, booklet cards, strong relic pieces, on-card rookie autographs, no redemptions. Bad: Minimal design difference from 2014, top rookie autographs again appear to be short printed, team coverage is inconsistent. The Bottom Line: With very little changes year-to-year, 2015 Inception Football is a product that is unlikely to alter your mindset. If you normally like it, then that will continue to be the case this year. If you are not a fan of the Inception design or format, little will sway you toward the positive. 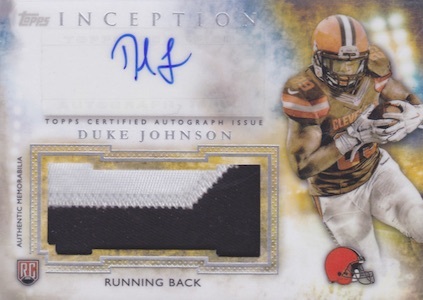 The fact is that as the top early option for on-card rookie autographs, Inception puts itself in a rare class. The overall quality and potential makes for a very intriguing product. As the saying goes, “If it ain’t broke, don’t fix it.” 2015 Inception Football takes that to heart as far as design is concerned, and it works. With only seven cards per box and a strong design consistency across most of the options, the brand continuity is apparent. Although the base cards and parallels do occupy a majority of the box contents, I do find myself wishing the parallels were less common. I like the look of the base cards and feel that the bold colors of the parallels tend to dominate the base design in a way that clashes. Also, since several of the Rookie Autographs don’t have true base options, this also applies there as well since the actual “base” version is one of the colored parallels. While the design is all well and good, the real draw of the product is the on-card autographs for the rookies. Stickers are rarely preferred and once you see how good these cards look with the hard-signed autographs, it is easy to imagine how disappointing a sticker would be in its place. Based on what I actually pulled, I cannot comment on too many of the inserts. However, the various booklets I have seen online are quite impressive and so are the Silver Signings. As is usually the case in these pack-per-box products, the checklist is ultimately the most important factor for collectors. Because of the rookie focus, that makes things a little more volatile, but since most of the big names are present, there is little to complain about. 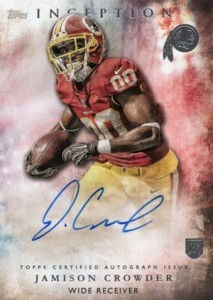 It again appears that the top rookie autographs are short printed. While it might be disappointing to the average collector that it is less likely they will pull a big name, the rarity does help overall values for the key rookies. Also, because each player still has multiple tiers of autographs, the total amount is still higher than it seems. 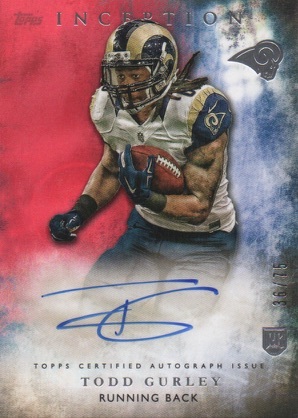 Although it is not as bad as recent years, one problem that seems to regularly surface in Inception Football is the inconsistency with team coverage for the rookie autographs. I realize that there are limitations based on what teams do with their early picks and which players attend the NFLPA Rookie Premiere, but you would think it would be the plan to have at least one option for every team. Also, redemptions are a huge point of contention for many collectors and 2015 Inception FB has none, which is a huge plus. 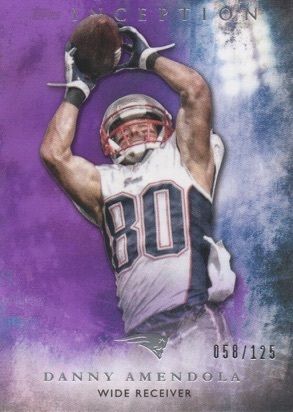 A classic example of actual value versus potential, the odds say 2015 Topps Inception Football is more likely to disappoint when it comes to box value, but the chance of pulling something big is definitely there. It really comes down to what kind of collector you are. Given the box price (around $80-90), many would be better off going the singles route. However, you cannot discount the potential for greatness and it can be very intriguing for collectors to chase the big hits. Sure, it is nearly the same as last year, but this does not mean it was a bad break. Inception is quick, clean and quality-based. The cards look great, the on-card autographs are very nice and the patches are impressive. Sometimes it can be very appealing to not have a stack of virtually-worthless base and inserts. Still, it would be nice if they mixed things up a little, like using foil to differentiate parallels instead of background color or adding a new wrinkle or two to the design. 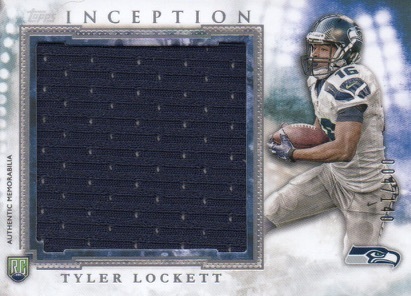 All things considered, 2015 Inception FB is a fun break. I can’t wait for this product to come out. The cards look great. Already plan to get a box soon as it comes out! DaTruthTeller � As noted in the profile, the images are mock-ups and not final. Inception FB will include NFL logos for the rookies. The base set is pretty disappointing they have only 2 Ravens but then they have guys like Toby Gerhart and Mike Glennon in the set. Also there is a Patrick Willis, Kyle Orton, and Wes Welker card in the set. Willis & Orton retired and Welker is still a free agent. Take those cards out and add a Forsett, Mosley, or Dumervil card. 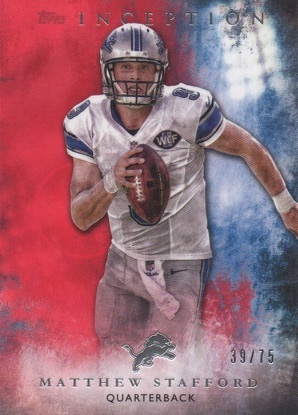 People aren’t going to be happy when they buy a $90 box with only 12 cards and they get guys like Glennon or players that retired months ago……..
Only two Dallas Cowboys cards in the entire checklist? Romo and Bryant base cards? What about Byron Jones who was drafted Round 1 Pick #27? Randy Gregory, Round 2 Pick #28? Absolutely ridiculous. Only 3 Giants? I understand that they picked a lineman 1st round, but they could have at least put Landon Collins in there…. Alex � No. The rookies will be featured in their NFL jerseys. Only Broncos are Manning, Thomas, Von and Welker. I might have missed but there is no RC like Shane Ray or anyone from the Broncos draft. A very small RC checklist. So basically I’m not looking to buy being a very boring looking set and ugly card design. Hopefully I will be wrong when this arrives but from the looks inception should be much better then this…. If all the rookies have their jersey numbers with double zeros like its been before then that would be even more lame. Maybe some effort on making a fun set would be a good idea, but so far no way am I wasting money on this. Too many people uninformed about this set. First, READ WHERE IT SAYS NFL LOGOS WILL BE ON THE CARDS. Next, the NFL and/or team have not gotten approved numbers for some players, so they are not allowed to put any random number (yes even college numbers) on them until they are assigned. These are signed at the Rookie Premiere, so the cards are already made, and if they don’t have numbers assigned at that point, there’s nothing Topps can do about it. Last, I understand the frustration for some teams with little to no players on the checklist. I don’t understand the inclusion of Glennon, Orton, etc. but for the rookies, it looks pretty solid as far as value. I think there would be way more people complaining if the checklist were even more watered down (i.e. more non-LB defensive players). 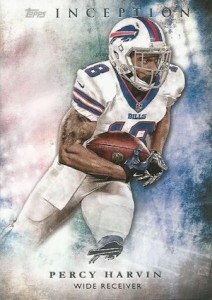 For the first release of the year for Topps, and being all on-card with no redemptions, it looks very solid. People stop complaining for one its all on card autos two no redemptions so those two alone should make most like this product alot, also the patch autos are really nice. For the integrity of this website, might I suggest an editing note? If anyone rates a product before it comes out, or makes it clear from their comment that they haven’t seen the product yet, perhaps the website should consider leaving the comment but deleting the rating. Ridiculous to think that consumers might actually decide whether or not to purchase a product based on a review that was made without ever seeing the product. Anyway, I got a box of this last night when it came out. I don’t usually like high-end products because I would rather spend my $100 or so actually putting together a base set and looking at interesting insert cards instead of just getting the hits in two seconds and that’s it. That being said, I did take a chance on this product because it is the first football product with team logos on the autos/relics. Prestige has logos on the base cards, but not the hits. I was happy with my box. I got a DeVante Parker Silver Signings on-card auto /50, a Vince Mayle patch auto /25 and a Brett Hundley jumbo relic /140. Nothing much to speak of from the 2 base and 2 parallel cards, but I did get a Cam Newton /50. The card design is very cool in my opinion, and I appreciate that all of my hits were skill position players (2 WRs and 1 QB) as opposed to offensive lineman or defensive players. I’m sure that’s not always the case. As high-end goes, this looks like a good product, especially being the first football product with NDL teams on the autos/relics. Jon H � Thank you for your feedback. We are definitely aware of the issue and are in the process of updating our review system. Congrats on the hits! Just once I would like to pull something from Inception that I was hoping to get. Over the years, zip on hits be it football or baseball. Still a nice product, Maybe someday! I like it better then last years Inception, this is the firs time since the 04 UD Ultimate that I have bought a one pack shot, as a Canadian paying 125 is a little much so this is a group break either pyt or random with a few teams and hope you get some of your money back. Norm >> The reason for sticker autos on the patch autos are because the cards get signed at the Rookie Premiere and there are no (NFL) jerseys available before this as that is the first time the players wear any type of NFL jersey. So, those cards are not made in time, and therefore have to have sticker autos. Yes, its unfortunate, but for this early of a release, it’s a miracle that all non-relic autos are on-card and there are 0 redemptions while having every single big name. Note: The booklets are on-card because Topps was able to make one half of the card (where the autograph is) separate from the other (where the giant patch is) and put them together after the fact. Obviously, this is not possible with a regular-sized card. Well Said Jon H. I also very much hate that people feel the need to rate a product good or bad months before it has even come out. I have brought this up before but I have no idea why it takes so long for them to fix this. I would think it would not be that difficult of a fix. Personally i like the look of the inception, i believe the box can be a bit cheaper though. 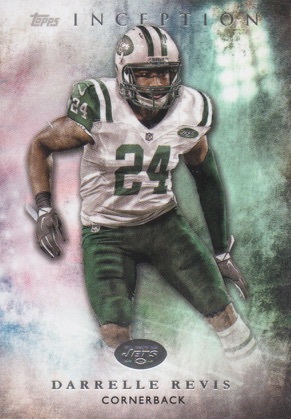 2015 Topps Inception Football Box - Hobby - 3 Hits!! !